Perhaps you have said, or heard someone declare, "I want DNR tattooed across my chest!" Well, someone actually had it done. See this image in JGIM of the tattoo and the unusual story behind it. In this case, the DNR tattoo was the result of a lost bet in a drinking game - bad idea jeans - the patient actually wanted to be full code! In an accompanying editorial, Bernie Lo and I describe the problem with actually tattooing DNR across your chest. As we say, the idea is intuitively appealing, but flawed as policy. What is behind the idea of the DNR tattoo? Why would someone say that, or do it? Imagine you are seeing a new patient who arrests in front of you. Preparing to do CPR you see a DNR tattoo on the chest. How do you respond? Why? Should DNR tattoos be respected? What can we do to protect the interests of people who really do not want to be resuscitated? Should we as a society put greater ironclad protections in place for people to irrevocably fix their code status at DNR? What are the risks? What if someone codes from anaphylaxis? Chokes on some food in front of you? What do you think about allowing leeway or flexibility in decision making? In all cases? Giving the surrogate leeway? The clinician? Do the advance directive forms or POLSTs you use allow for leeway? Should they? What do you think about Ulysses contracts? (Then Ulysses said, "Eurylochus, come quickly! Tie me to the mast, for I shall hear the Sirens song and live!"). Caringadvocates offers such documents (run by frequent GeriPal commenter Stan Turman). Example: do not give me food or water when I have advanced dementia, no matter what I say or do. Feel free to share your teaching experiences in the comments. I think the geriatrics and palliative care communities really appreciated the discussion about how to use this video from a previous post as a teaching tool. This link, ( http://news.bbc.co.uk/2/hi/health/2819149.stm ), apparently from 2003, shows the same tattoo but with a different story. Please note that the image in the picture above is not the same as in the story described in JGIM. Click on the link in the caption or text to see that image (i didn't want to violate copyright). 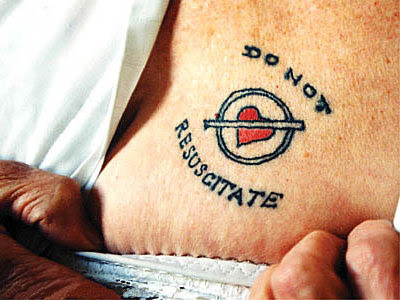 I took care of a hospice patient once with a tattoo on his chest, "NO CPR, no resuscitation". He was a quadraplegic post MVA many years previously. It was not considered valid once he died. Due too, " NO WITNESSES signatures". So this mans extreme measures to have his wishes known, we're to no avail! I thought this was very sad! I'm an EMT working in NYC, and I've been talking about getting a tattooed DNR for ages, though I plan to wait until it becomes legally valid. My idea is to pass a bill that would establish the legality of a tattooed DNR if it included a tattooed copy of my signature, my doctor's, and a witness. Part of obtaining the DNR would include the text of the tattoo on carbon paper complete with the original signatures, which a tattoo artist could then just use as his template. All I know is that I want one. I've seen too many dying and dead people to ever want that kind of quality of life.